Good Morning! Today is my day to post on the SVG Attic blog. I am sharing a card that's intended purpose is a Valentine's Day card, but I made it for a very different reason. A close friend of mine had a Grandpa pass away and her favorite color is purple. So I got out my Lilac Love stack from DCWV and the stitched heart card file from JGW Sewn From the Heart set and got to work on a sympathy card. 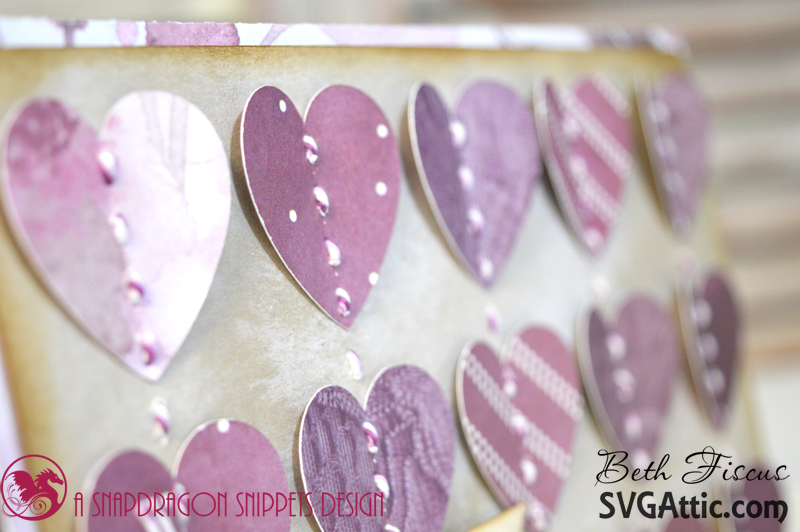 I used Grape Fizz Trendy Twine to lace all of the hearts onto the card base as well as the bow on the sentiment banner. A few adhesive pearls were the only additional embellishments I added to this card. For an assembly tutorial for this card, check out Jodi's blog! I love this card!! I am sure your friend loved it too! Simply beautiful! Such a pretty card! I absolutely love the design even though it's a sympathy card. The twine stitching looks amazing and the papers you used are absolutely gorgeous! Totally love this! Beth wonderful design love that you make the card purple for you friend I am sure this card meant so much to her. What a lovely card. I am sure your friend will love it.